Cpl. 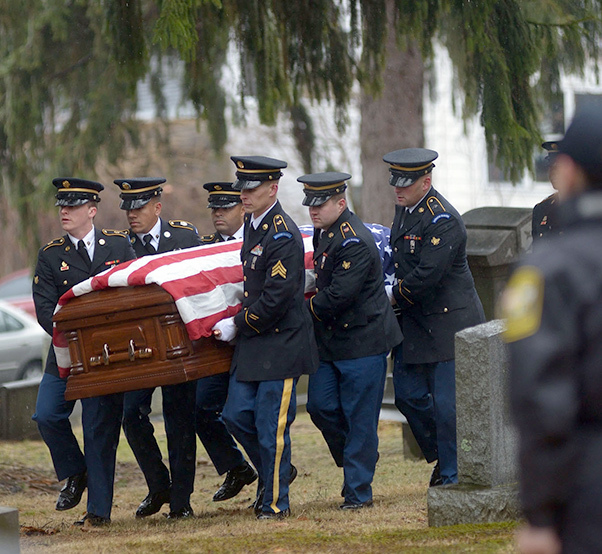 Jules Hauterman Jr., a Korean War veteran, killed in action Dec. 2, 1950, is carried to his final resting place in Holyoke, Mass., March 31, 2017. Bobby Whelihan was only 10 years old when he watched his cousin, Jules Hauterman Jr., depart for the train station in Holyoke, Mass. Hauterman was off to join the Army. Little did Whelihan know he’d never see his cousin again. Hauterman’s departure happened in the weeks following the June 25, 1950, invasion of South Korea by North Korea. It was around then that Hauterman received orders. The entry of China into the war in October and their drive south into Korea surprised the Americans of Task Force Faith. They found themselves quickly outnumbered and outgunned. Some of the fiercest fighting of the war took place in November and December of 1950, in the vicinity of Chosin Reservoir in North Korea. That’s where Hauterman and his battalion were when the Chinese attacked. During the fighting, over half of Task Force Faith were killed or wounded. Hauterman, age 19, was listed as missing in action, Dec. 2. Cpl. Jules Hauterman Jr., a Korean War veteran, killed in action, Dec. 2, 1950, is pictured atop his casket during his belated funeral in Holyoke, Mass., March 31, 2017. Bill Dean, 59, also grew up in Holyoke, but was too young to have known Hauterman. Dean said he became interested in Hauterman because his mother, Claire Dean, was taken in by the Hauterman family around 1935, when she was only 5 years old. Bill Dean and Hauterman share a connection beyond just Dean’s mother and their hometown. Both men served in the Army. Dean served from 1977 to 1980 and became a field artillery cannon crewmember with 1st Battalion, 75th Field Artillery Regiment in Bamberg, West Germany. Claire passed away in 1991 and Dean said he didn’t think too much about the Army or about Hauterman until earlier this year. It was then, he said, that he read a local newspaper article about Hauterman finally coming home. “It really touched me,” he said. All of the memories of Hauterman, as relayed to him by his mother, came back to him. After that, Dean said, he started to read books about the Korean War. Among those was “East of Chosin: Entrapment and Breakout in Korea, 1950,” by Roy E. Appleman. He said that book is his favorite, and it’s also where he learned that Task Force Faith was nearly annihilated while in Korea. Dean said that while some have made claims that the task force didn’t fight bravely, documents from the Chinese and other sources have surfaced in recent years that refute that notion. The task force, he said, helped prevent the Marines, who were located nearby at Hagaru-ri, from being overrun. The task force held the Chinese off until the Marines could affect a withdrawal, he said. Cpl. 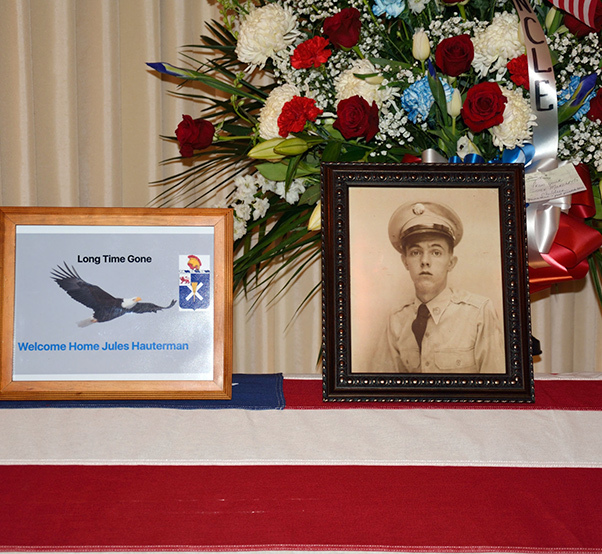 Jules Hauterman Jr., a Korean War veteran, killed in action Dec. 2, 1950, had his belated funeral in Holyoke, Massachusetts, March 31, 2017. 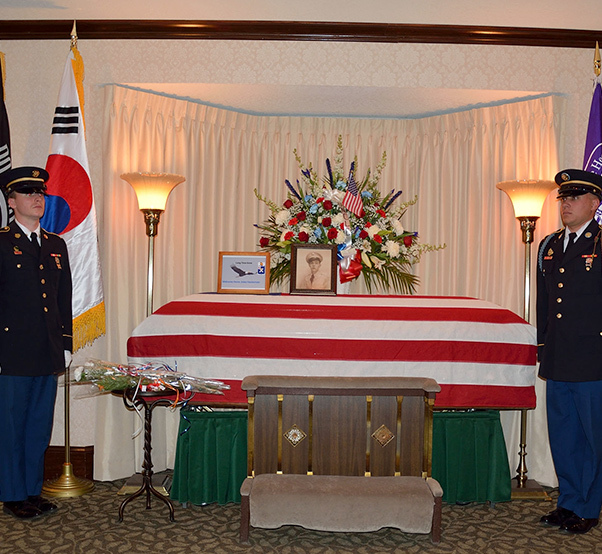 In 1954, Hauterman’s remains were discovered on the eastern side of Chosin, Dean said. They were flown to the Joint Prisoners of War/Missing in Action Accounting Command lab at what is now Joint Base Pearl/Hickam, Hawaii. Back then, investigators were unable to identify those remains, Dean said. So at the time, nobody knew they were Hauterman. But recently, new forensic techniques have enabled a positive identification. About six months ago, he said, the remains were identified as Hauterman. 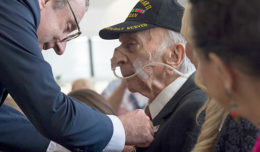 Whelihan, who served as a Navy corpsman in the 1960s, said forensic evidence indicates that Hauterman died quickly in an explosion, probably from a grenade or mortar round. After receiving word of the positive identity, Whelihan said he and other surviving relatives petitioned the Army to return the remains to Hauterman’s hometown. The Army also provided an honor guard for the funeral, which was March 31 this year, he said. 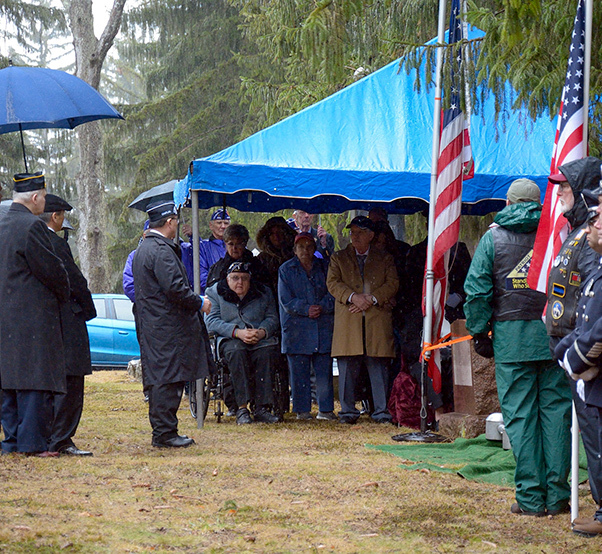 The Patriot Guard Riders and the Marine Corps Korean War veteran group “The Chosin Few,” also attended. Dean said that nearly 1,000 participated in the funeral or lined the streets where the funeral procession took place. Charlie Baker, the governor of Massachusetts, had the flags lowered to half-mast at the state house to honor Hauterman’s service and sacrifice. The Army also awarded Hauterman the Purple Heart Medal, Dean said. A long time ago, the Army awarded the Purple Heart to him, which was accepted by his sister. His sister later gave the medal to Claire Dean, Bill’s mom. However, the medal was subsequently lost in a house fire. Dean said he’s glad Hauterman now has a Purple Heart. Lt. Col. Don C. Faith Jr., a World War II veteran, served as commander of 1st Battalion, 32nd Infantry Regiment, Hauterman’s unit. Task Force Faith is also named for him. 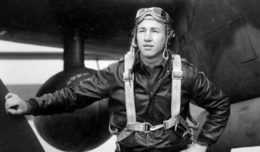 Faith was killed Dec. 2, 1950, the same day as Hauterman, and was subsequently awarded the Medal of Honor. As with Hauterman, it would take decades before his remains were finally recovered in North Korea and identified. He finally came home April 17, 2013 and was buried in Arlington National Cemetery. Cpl. 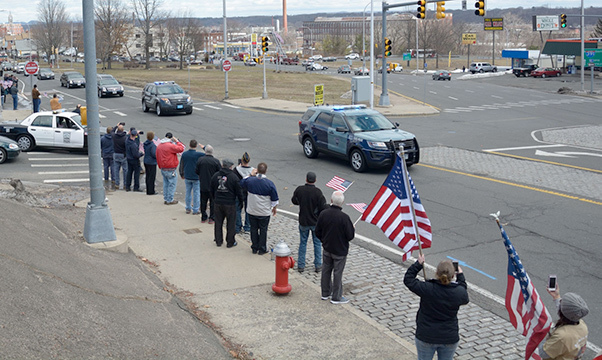 Jules Hauterman Jr., a Korean War veteran, killed in action Dec. 2, 1950, is transported to his final resting place in Holyoke, Mass., March 31, 2017. Dean reached out to Faith’s daughter, Bobbie Broyles, by speaking to her on the phone and making her aware that one of her father’s Soldiers came home. “She was thankful and was happy our family could have closure as well,” Dean said. Cpl. 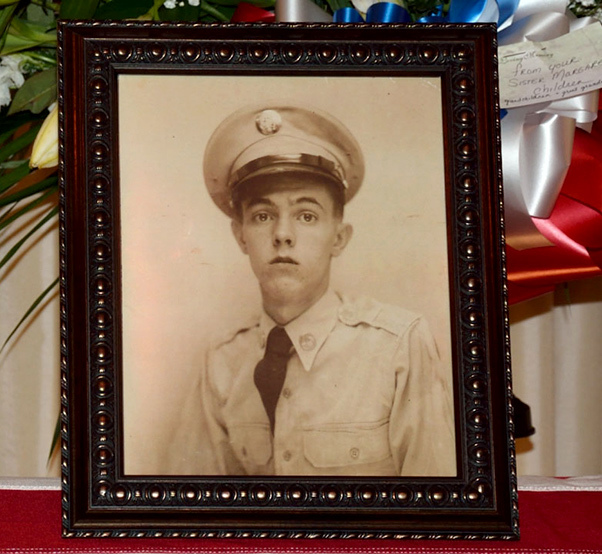 Jules Hauterman Jr., a Korean War veteran, killed in action Dec. 2, 1950, had his belated funeral in Holyoke, Mass., March 31, 2017.